Becky Paskin's third day at Tales of the Cocktail 2015 proves whisky brings people together like nothing else. 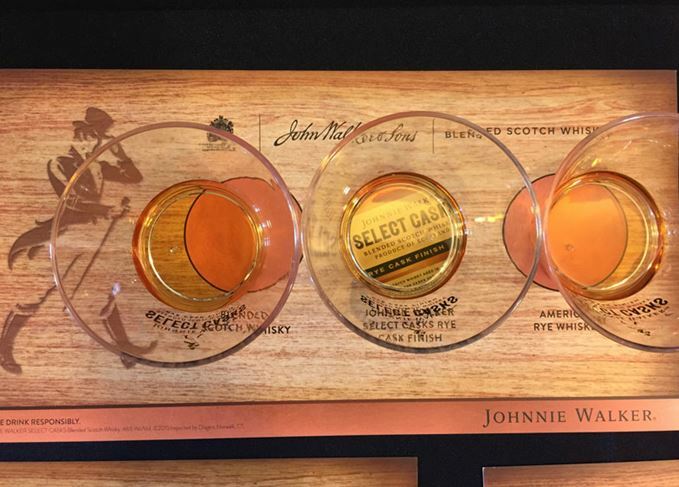 Walking on the rye side: tasting Johnnie Walker's new Select Cask. One of the benefits of attending Tales of the Cocktail is getting to sample new spirits releases before anyone else. Producers often use the busy festival as an opportunity to launch a new expression, and this year the new release at the top of my list to try was the Johnnie Walker Select Cask Rye Cask Finish, a new 10-year-old blend from Diageo, that as the name suggests, is finished in rye casks. This being Tales it wasn’t enough for Diageo to simply pass out samples of the whisky – a tasting room dedicated to dissecting the flavours of the new release was erected and manned by Johnnie Walker brand ambassadors, some of whom were Masters of Whisky (that’s a subject for another day). Sampling the new expression alongside JW Red Label and a 95% rye whiskey brought an interesting perspective to the release, which could only be described as more rye whiskey than Scotch. Johnnie Walker’s accessible, soft character had been replaced by the spicy, eucalyptus notes inherent to rye, making it almost unrecognisable as a Scotch whisky. It wasn’t wholly awful, just… not Scotch. As I left the tasting room I couldn’t help thinking the Rye Cask has something to do with turning around the brand’s falling sales in the US by appealing to American whiskey drinkers. Tristan Stephenson, David Kaplan and Dave Broom join me for our Write Yourself Famous seminar. Drinking whisky at 10am is not normal practice for me, but this is Tales and I do need an ounce of Dutch Courage – that afternoon I would be presenting my first seminar, called Write Yourself Famous. The premise was to teach bartenders and wannabe writers how to write a book or for a newspaper or magazine in order to raise the visibility of themselves and their bar. It must have been down to the stellar panel next to me – the inimitable Dave Broom, Death & Co’s David Kaplan, and author of The Curious Bartender, Tristan Stephenson, as to why the room was at capacity. These fellas all have a wealth of wisdom to impart to aspiring authors that I hope the audience left after our 90 minute session with an idea of how to go about getting published. Time for some more refreshment, courtesy of the refined Café Torino pop-up by Martini where my newfound love for vermouth and tonic began, and some dinner at the reliable vegetarian-friendly Green Goddess in Exchange Alley. It’s one of the only places in New Orleans where vegetarian means just that and doesn’t come with a pile of chicken and shrimp because ‘it’s not really meat’. Dinner was needed – their tofu po-boys are seriously addictive – to set us up for the Bacardi portfolio party. In its bid to out-do William Grant & Sons’ futuristic stormtrooper festival and Diageo’s Backyard Bash, Bacardi threw a lively, entertaining street party at The Sugar Mill out on Convention Centre Boulevard. Breakdancers, DJs, Ents (walking trees for non-Lord of the Rings fans), and drinks courtesy of pop-ups and a St-Germain bicycle cart ridden by its gorgeous ambassador Camille Vidal, made for an eclectic and colourful event. The evening was fantastic – free booze, friends all around, and I even had a glass of Aultmore 21 in my hand. However the delight turned sour very quickly, as a fellow reveller nudged my arm on his way past, coating my arm and dress in some very fine whisky. I legged it back to the Dewar’s pop-up – which was designed like the Perth wine and spirits store established by John Dewar in 1846 – to grab a towel. Most people who spill someone’s drink will simply apologise and get on with their fun, but this guy was different. ‘I’m sorry, I’m so sorry,’ he said as he followed me to Dewar’s grocery store, handing me a towel. ‘Come on, let’s have a whisky to make up,’ he offered. Fine, I thought, he seems genuine; I may as well be humble. ‘So, where are you from, what’s your name?’ I asked out of politeness. As he handed me his business card a smile erupted on my face. Sadly, as a drinks writer, I speak to so many people around the world I often never get to meet face-to-face. Of course this guy was kind and apologetic, he has had some of the best training in hospitality a person could get. This guy in front of me, who had spilled my drink but made such an effort to apologise, was Zdenek Kastenek of 28 HongKong Street in Singapore, a bartender I have spoken to for years but never had the opportunity to meet. ‘You’ll never guess who I am,’ I said proudly, handing my business card over. The spillage incident immediately forgotten, we clinked our newly-replenished glasses of Aultmore. We live in opposite corners of the world, but despite having the good fortune to be at the same party, it took a spilled drink to unite us. Whisky really does bring people together. Whisky brings people together: sharing a dram with Zdenek Kastanek. From hedonism to geekiness, with Scotch whisky playing an ever more significant part. The annual New Orleans cocktail festival brought a taste of the Deep South to Scotland’s capital.